Covering a broad swathe of England, the Midcounties Co-operative is the largest independent co-operative in the UK, with sales of £1 billion. It has headquarters in Warwickshire, with trading outlets in Oxfordshire, Gloucestershire, Wiltshire, Shropshire, West Midlands, Worcestershire and the surrounding counties. Owned by 439,000 members it employs over 10,000 people across a variety of businesses. These include retail, travel, pharmacy, energy, funeral care, post offices and childcare. The Midcounties Co-operative initially deployed Hornbill Supportworks ITSM Enterprise service desk software following a 2004 review of their ITIL processes. Since then the organisation has grown steadily, more than doubling to its current size. This was partly from entering new business areas, including childcare and energy. As a result, while the number of employees doubled, he number that relied on IT for their jobs grew by a much larger proportion. From 2009 to 2012 alone, the number of IT users at the organisation grew from 7,000 to 10,000 while in the same time the number of IT support calls grew from under 600 a week to 1,300. The growth into heavily regulated areas such as childcare and energy also meant that there was an increasing need for IT governance. Using Supportworks, the Midcounties Co-operative can support more users with fewer resources. Despite the number of IT support calls a week rising by over 700, the IT service desk has only had to increase its own staff from 55 to 70 over the last three years: at the same time growing its turnover from £750m to £1billion. The ITSM team support over 10,000 IT users across an increasing number of business areas and their accompanying regulatory demands: a task that in most organisations would demand a high growth in IT resources and expenditure to accomplish. This is thanks to Supportworks’ self-service capabilities, which have helped the IT services team reduce time spent on IT support calls by 30%. Supportworks also records all transactions to ensure compliance in sensitive areas such as childcare and energy. As a result, the IT services team are free to concentrate on maintaining and improving the quality of IT services as the organisation continues to grow. The Midcounties Co-operative’s growth has resulted in an increase in workers using IT, to over 10,000. However, through using streamlined ITSM processes together with the automation and self-service capabilities of Supportworks, the support and provision of IT services has been made as efficient as possible. As a result, the IT team has only had to increase from 55 to 70 members. 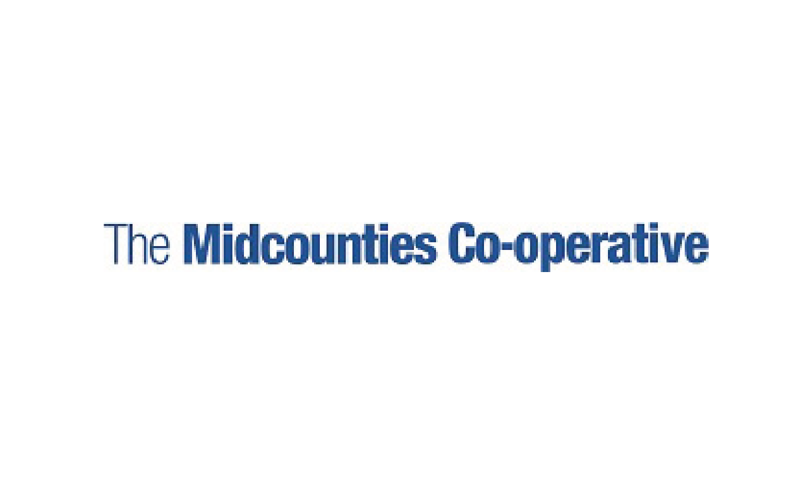 The Midcounties Co-operative has also expanded into a number of new business areas such as childcare and energy that are heavily dependent on technology and compliance with stringent regulations. Most organisations would require high growth of IT resources to meet the demands of effective IT governance within a rapidly growing business: with Supportworks, the co-operative has dealt with a growth in support calls by over 700 a week while still delivering a higher level of service to users. The Midcounties Co-operative has a wide range of IT users at differing skill levels: from newcomers to seasoned professionals, each needing and expecting a different level of IT support. The Supportworks self-service portal allows workers that are competent with technology to self-diagnose and fix simple issues, directing less confident customers to first-line support. The Co-operative’s rapid expansion has taken it into a number of sensitive areas, requiring close regulation: for example, it is now the 5th largest childcare provider in the UK meaning that all actions must be compliant with Ofsted regulations. By automatically recording the details of every transaction, Supportworks provides the IT services team with an audit trail of all IT activity, helping them prove compliance. Hornbill was initially implemented to ensure that the Cooperative benefited from best practice the ITIL framework. By evolving the implementation over the past 8 years, the organisation has been able to keep pace with ITIL’s development, ensuring that it consistently follows the guidance of established best practice as technology and the ways in which it is used evolve. 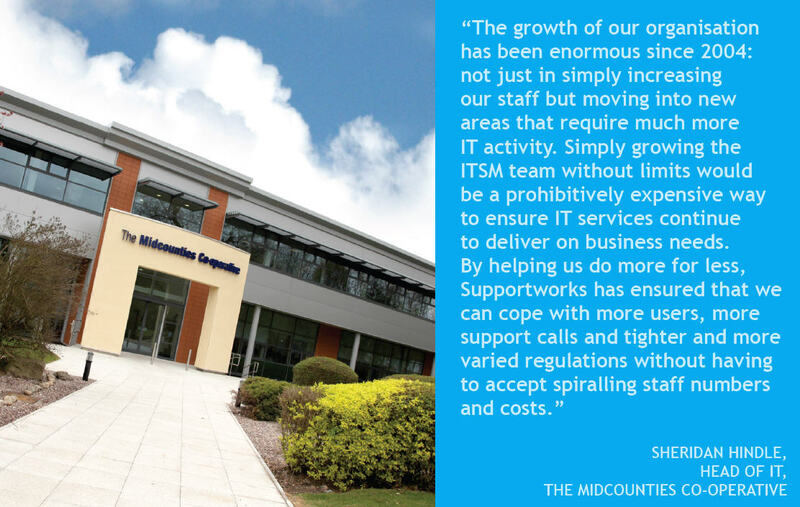 The simplicity of the upgrade process with Supportworks means that Midcounties can keep pace with ITIL changes easily and effectively. The Midcounties Co-operative does not expect IT to stand still: for example, the IT Services team is already planning for a growth of workers using personal devices in the workplace. By offering full integration with Twitter and smartphones, as well as adapting to new technologies, Supportworks has helped the team consider the potential business benefits and plan for integration. Initially implemented to support ITIL best practice, Supportworks has helped the Co-operative IT services team support massive growth in the company, more than doubling in size and adopting more IT-intensive operations without having to grow the team and massively increase the IT budget to match. - Despite the number of IT users growing from 7,000 to over 10,000 and needing more complex service and support, he ITSM team has only had to grow from 55 to 70. - IT services can keep pace with rapid growth, reducing call volume by 30% despite an increase in calls from under 600 to 1,300 between 2009 and 2012.